Taking a Disney Cruise? 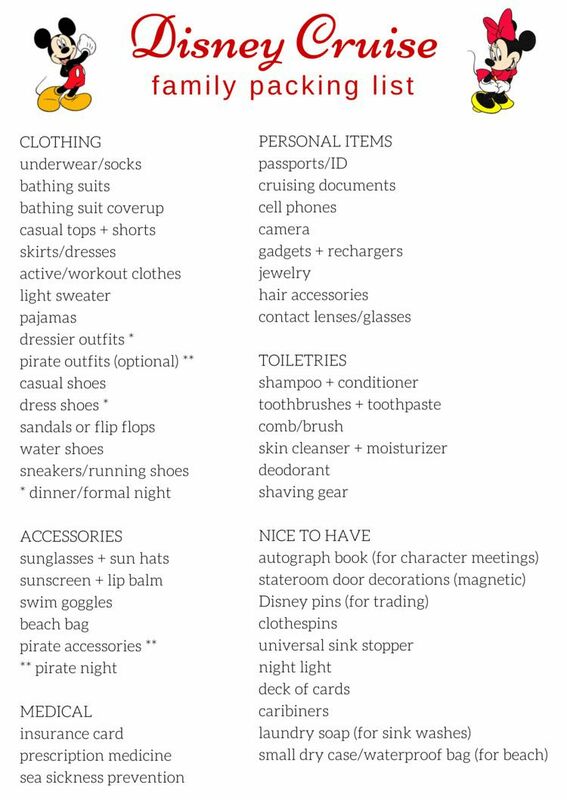 This free printable packing list will help you stay organized. A Disney Cruise is a treat for the whole family. What you choose to bring on board can help you make the most of your family vacation. Think through how you want to spend your time on board and what experiences you would like to include in your schedule. Dos and Don'ts for Embarkation Day - Make sure you get to the port and are ready for fun from Minute One. Be sure you know what to pack in your carry-on bag so that you can begin enjoying the ship even before your luggage arrives in your stateroom. For example, if you choose an early boarding time, it's handy to have your swimsuits and pool gear, including goggles and sunscreen, with you so that you can enjoy the pool deck even before setting sail. Dos and Don'ts for Dining on a Disney Cruise - Make the most of your meals on board. There is no "formal night" on a Disney Cruise, but passengers tend to dress smartly for dinner in the main restaurants. For adults, a typical look is either a suit or shirt and tie for men; dresses/skirts or dress pants for women; polo shirts or similar for boys; and dresses or coordinated outfits for girls. On "pirate night" many passengers dress the part and on any given night you often see young kids wearing costumes of their favorite Disney characters. If you plan on dining in either (or maybe both) of the wonderful adults-only specialty restaurants, you'll want to dress up a notch or two: suits for men and semi-formal dresses for women. Insider Disney Cruise Hacks Seen on Pinterest - Pinterest is full of ideas for making first-time cruisers feel like veterans and includes optional take-along items that can make your cruise go smoother. Find out why, for example, magnets and clothespins are handy extras to have with you. Inexpensive DIY Disney Souvenirs ideas will spark your imagination to include permanent markers among your must-bring items. You can easily turn affordable items from the dollar store into personalized keepsakes with the help of special Disney friends on the cruise. If you are sailing during a special event, such as Halloween on the High Seas or Very Merrytime Cruises during the holiday season, you may want to pack special seasonal items or costumes for some of the special events and parties. Finally, don't forget your smartphone. Download Disney's oh-so-handy Navigator App before you board so that you stay up-to-the-minute on events, meals, and activities happening on the ship. You can even communicate with family members through the app without using extra data.